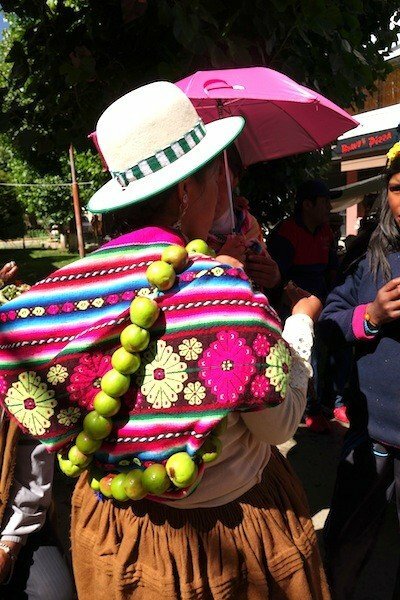 OVERVIEW: This is a fabulous 14-night Textile Tour of Bolivia, an amazing country little-visited by North American travelers. 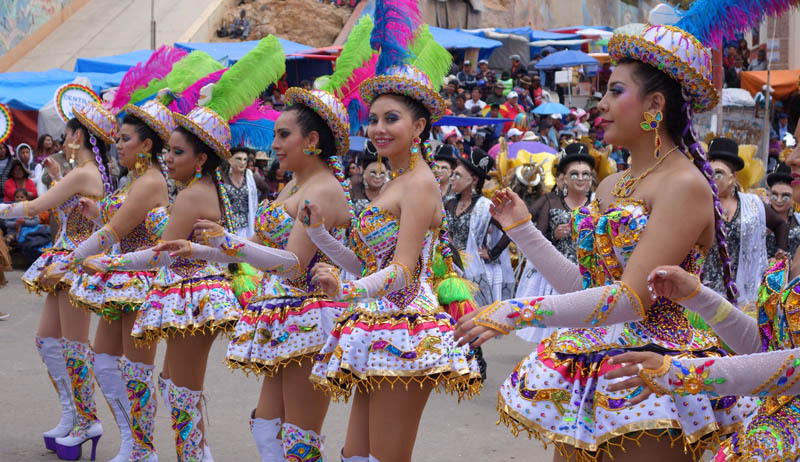 Bolivia is not only famous for textiles, but also for the exciting Carnival event in the otherwise sleepy mining town of Oruro. We’ll first see the intricate weaving and the amazing knitting, sleep in a peaceful rural hacienda, visit historical places such as colonial Sucre, the famous silver-mining city of Potosi and the enigmatic city of LaPaz. Designed to be the highlight of our Carnival and textile tour, the celebration in Oruro will thrill you with the villagers’ handmade outfits and textiles on Thursday and the elaborate satin and sequined costumes, masks and brass band music on Saturday. Arrive in La Paz from home in the morning of February 19. (Depart for home on March 5.) We’ll plan our flights to arrive, and meet at El Alto International Airport in La Paz, literally ‘the Heights!’ To acclimate as soon as possible (with the airlines’ new schedules) we’ll descend to the hotel in La Paz and stroll the nearby shops and markets for the day. We’ll spend the night of the 19th in La Paz then fly the next morning – 1 hour – to the beautiful city of Sucre where we will spend the next few days at lower altitude. Check into our lovely hotel, in an 18th C mansion, with terraces full of flowers, below; take a city tour and visit a fascinating handmade felted Hat Factory! Sucre is one of two capitals of Bolivia (with LaPaz) and despite its population today of around 300,000, the historical center with its notable colonial architecture is pleasant to stroll around in. Sucre is also the center of expert textile production. History of the city of Sucre is interesting. In 1559, the Spanish King Philip II established the Audiencia of Charcas (high court of justice) in Sucre. It had authority over an area of present-day Paraguay, southeastern Peru, northern Chile and Argentina, and much of Bolivia! In 1624 St. Francis Xavier University of Chuquisaca was founded here. It is one of the oldest universities of the New World, housed in a stately building. We’ll visit the University’s Anthropology Museum, with good folklore and ethnography exhibits, and the local market with crafts, textiles and produce. We’ll also see the superb textiles at the excellent ASUR Textile Museum, in a 17th C colonial home. 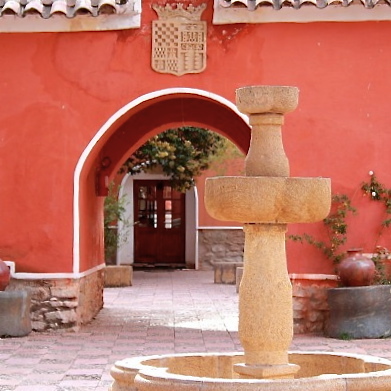 This small museum and the museum shop show and sell traditional pieces from the towns surrounding Sucre: Ravelo, Potolo, Tarabuco, and Candelaria. Watch weavers at work in the courtyard, using different techniques and oblique looms. 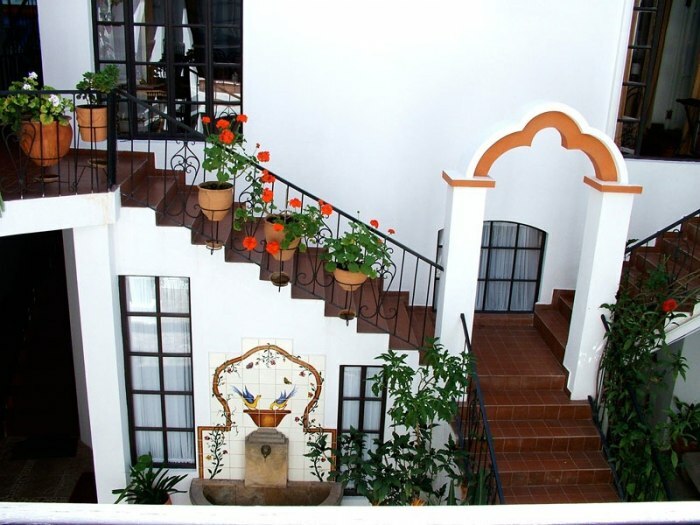 Later, relax on the hotel’s rooftop terraces or walk around Sucre’s pretty central plaza, only three blocks from our Hotel. After a couple of days in Sucre, we’ll drive by private van to the historical silver mining city of Potosi (3 hours, with interesting stops along the way). It is known as the world’s ‘highest city’ and is notable for the riches (and tragedies) of its mining history. In the mid-1500s, the founding of the city and the discovery of fabulously rich silver veins went hand in hand. By the end of the 18th century, Potosi had grown into the largest and wealthiest city in all of Latin America. Many beautiful colonial churches and buildings still hint at this former splendor. We’ll visit the Carmelite Santa Theresa Convent that dates from the late 1600s. The convent has amazing art and artifacts, and shows a sad but interesting part of old Spanish-Catholic-influenced history. Visit the Royal Mint (Casa de la Moneda) if there is interest, where colonial coins were produced on a variety of machines. Then we’ll drive a short ways outside of Potosi, through a dramatic agricultural valley to our rural Hacienda (left), arriving in the afternoon. We’ll spend two nights at this peaceful retreat, relaxing and reading, knitting, hiking, etc. The farm and mansion date from colonial times. The hacienda was an encomienda (grant by the Spanish Crown to a colonist in America) whose title dated from 1557, making it the first hacienda in “New Toledo,” or present day Bolivia. The rural hacienda remains a working farm, producing vegetables and dairy products for its own guests, and to be sold in the city. Staying there is like relaxing in a comfortable, antique-filled home of a gracious friend. The library, private chapel and museum are fascinating. The focal point of the living room is a cozy fireplace, and we’ll have delicious and typical meals in the dining room. If possible, we’ll drive out to accessible weaving villages (last year the road was too muddy so we found weavers in town). 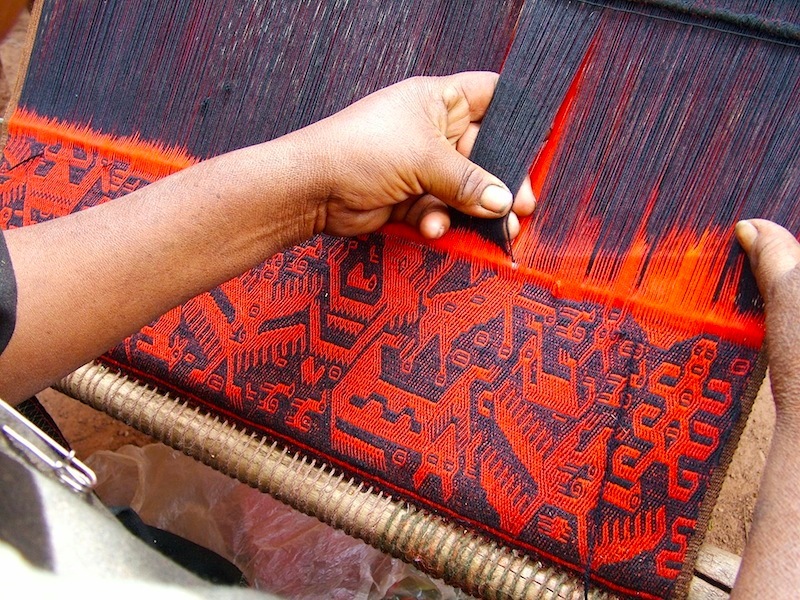 In this rural area, local women weave the well-known red and black textiles (right) and men weave brilliant tapestries full of animals and birds. 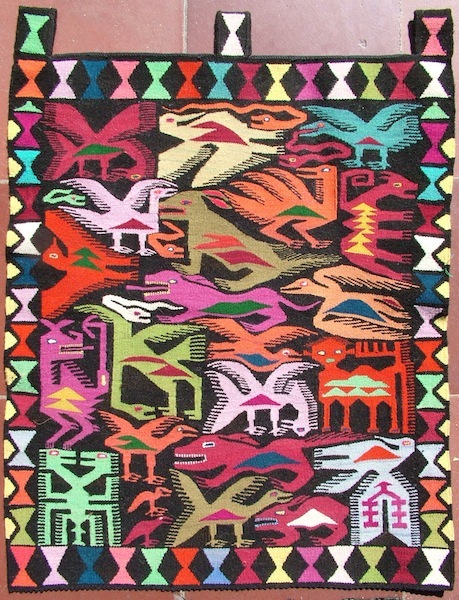 These indigenous communities that belong to the Jalq’a ethnic group maintain their traditional culture in the architecture of the houses, the agricultural techniques and especially in the handmade textile production, which is totally unique. 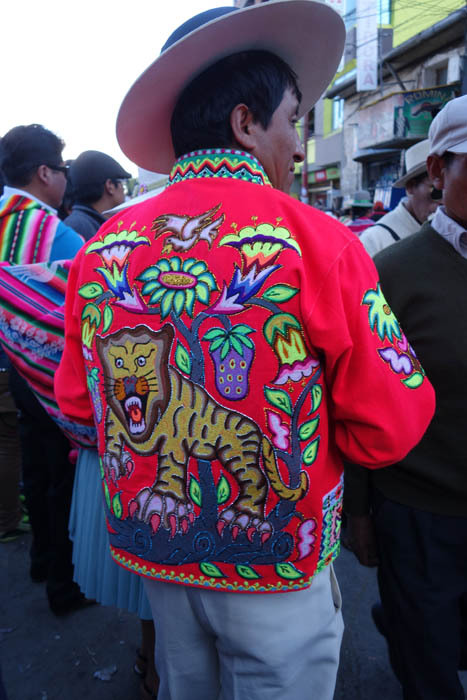 Knitting is also fine and detailed in villages around Potosi; we will see examples. We’ll return to Sucre, then leave early on Sunday for the town of Tarabuco and its weekly market full of textiles and all the usual garden produce. People living in this area maintain their traditional culture, evident in their unusual dress, interesting customs, and Quechua language. Men typically wear rounded, black leather helmets, called monteras, reminiscent of the conquistadors’ helmets, with colorful hand-woven ponchos, pants and sandals. 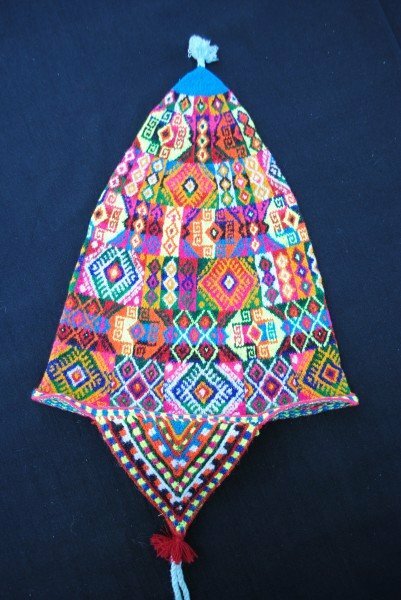 Women also wear hand-woven clothing with boat-shaped hats, and adolescents and some women wear yet another type of hat, a tightly crocheted, black version called a “tadpole” hat because of the tail in back. 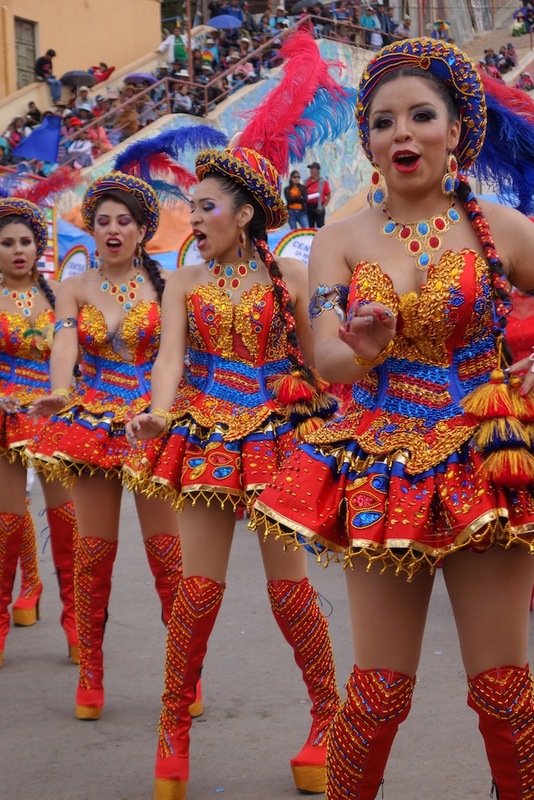 We’ll drive to Oruro, arriving in time to see the indigenous people’s carnival called Anata Andina. Invited groups of villagers from far and near converge in Oruro, wearing their very best, newly hand-woven clothing and hand-knit caps. Their brilliant outfits are often adorned with bundles of greens or strands of fruits and vegetables, as symbols of fertility. The musicians play wooden flutes and handmade drums. Llamas or sheep sometimes accompany the groups. On Friday at mid-morning we’ll go to the main market for the delicious treat of Api, the hot, sweet corn drink and fried Pasteles with powdered sugar – yum! We’ll visit the Bolivar Markets with stalls of brilliant Anata costumes and accessories, and perhaps watch some Carnival preparations. Go to bed early in preparation for the big event tomorrow: Saturday Entrada, or grand opening of Carnival. There are approximately 50 groups with hundreds of dancers each, so it is a huge event. The goal is to dance the whole route, right up to the church on the hill, three kilometers. These groups are different Bolivians than the villagers. The Saturday performers are apt to be system programmers or teachers, taxi drivers, or doctors and lawyers. They dress in masks and costumes that are intricate, expensive and often heavy and uncomfortable, as in the case of the girls dancing the entire 3 km. parade route in tall boots with platform heels! The main day, the Entrada of Carnival, is an all-day event, often ending at 2-3 am. We will have bleacher seats and simple box lunches. You may watch as much or as little as you like, of course. 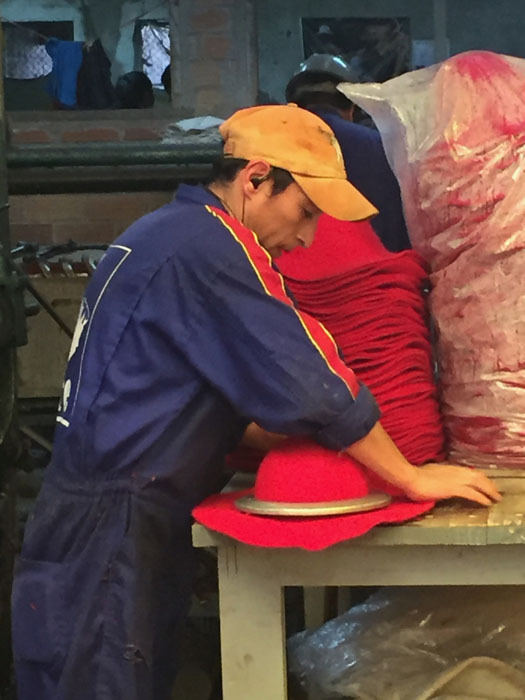 There is a huge variety of costumes including Devil dancers, furry bears, Morenadas in huge embroidered cardboard outfits, Caporales with bells on their boots, and so forth. There are five devil groups called Diabladas with both men and women performing various roles in the dance. Cynthia will explain the groups and offer hand-outs about the many groups, so you will know a bit more about what you are seeing! The whole event is really spectacular. You might want to watch from the bleachers for a few hours, then relax at the hotel for a while, then go back out to watch the night-time displays. One Devil group that performs late has light-up masks and pipes that shoot out propane flames! Finally, drive back to La Paz with time to visit the town. Check into our sweet hotel, have lunch, then walk down Sacarnaga, the street of textiles – and spend the rest of the day exploring La Paz on your own. Next day is a free day in La Paz; you could take an optional day trip to the archeological site of Tiawanaku. Our hotel’s tour department has convenient and good Tiawanaku guided van tours which include lunch, for a nominal cost. The Museum of Ethnography and Folklore is very interesting with drawers full of very accessible textiles to admire. We’ll have our Farewell Dinner, saying goodbye to fellow travelers on our Textile Tour of Bolivia! Get a good night’s sleep for early departure the next morning, March 5.